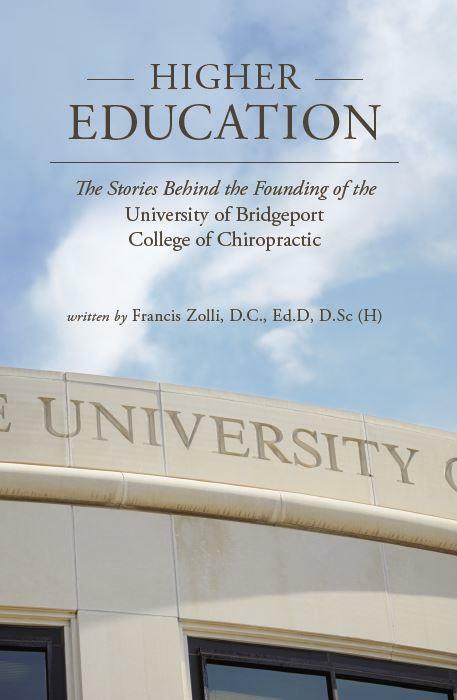 FRANCIS (FRANK) ZOLLI is the founding dean of the first university based chiropractic program in the United States. He is a graduate of St.Peter's College in Jersey City, New Jersey where he received a B.S. in Psychology. He next entered the Columbia Institute of Chiropractic (C.I.C.) to study for his professional degree. By the time his studies were completed, C.I.C. had become the New York Chiropractic College from which he received his Doctor of Chiropractic degree. While working on establishing the chiropractic program at UB he received his Doctor of Education degree from the University of Bridgeport. His doctoral dissertation was: Professional Trade Associations, Accreditation Standards and Anti-Trust Legislation: Implications for the Chiropractic Profession. He was also awarded an honorary Doctor of Science degree from Hanseo University in South Korea in recognition of his eff orts in helping initiate Hanseo's establishment of a chiropractic program. In addition to working in chiropractic education, Dr. Zolli also practiced, at various times in New York, New Jersey and Connecticut. He retired from private practice in 2004. He is currently a Professor of Clinical Sciences at the UB College of Chiropractic where he teaches the History and Philosophy of Chiropractic, Clinical Orthopedic and Neurological Testing and he supervises patient care. MindStir Media LLC is an award-winning book publisher. To learn more about publishing a book with MindStir Media, visit or call 800-767-0531.